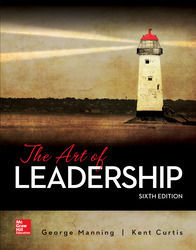 The authors believe leadership is an art that can be developed through mastery of nine key areas of success. The successful leader must possess knowledge and skills in the following areas: understanding leadership variables, the power of vision, the importance of ethics, the empowerment of people, leadership principles, understanding people, multiplying effectiveness, developing others, and performance management. The authors also believe when the leader is committed to the task and is concerned about people, these qualities serve as magnets and motivators to followers, and their potential for achievement becomes enormous. The Art of Leadership emphasizes an interactive approach to learning - its purpose is to stimulate and build competency. CONNECT: A highly reliable, easy-to-use homework and learning management solution that embeds learning science and award-winning adaptive tools to improve student results (applied and practical, results-driven technology).